If you own a car, motorcycle or any motorized vehicle, you need insurance to cover those unfortunate accidents that may happen. No matter how careful you are, bad things happen. Perhaps the driver of the car behind you is a little too busy talking on the cell phone and not really paying attention or you happen to park your car near a tree that falls on your vehicle. 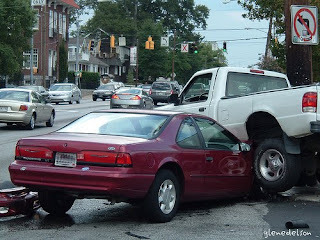 Sometimes, you may have a minor fender bender that you can pay for out of pocket or the damages may just be cosmetic and you decide not to repair the damage. One thing you don't want to do is make a bunch of small claims. Each time you make a claim, there is a possibility of the claim showing up on your motor vehicle report. A motor vehicle report (MVR) is similar to a credit report for your driving history. Just as having a lot of debt can decrease your credit score and cause you to pay higher interest rates, a bad driving record can cause you to pay higher insurance rates. How can you save money on your auto insurance? High Deductibles. If you have money set aside to cover unexpected expenses, I recommend maintaining a high deductible. I carry a $1000 deductible on my vehicle. A deductible is the amount of money you are responsible for before the insurance company will start covering the damage. The higher your deductible, the lower your insurance rate will be. Be careful when you choose your deductible! If you can only afford to pay $250 out of pocket, don't choose a $1000 deductible. Drop Extra Coverage. It may not make sense to carry anything more than basic liability coverage on your vehicle. There are several rules of thumb to determine whether or not you need to carry Collision and/or Comprehensive coverage. If you still have a loan on your vehicle, your lender will require you to carry Collision and Comprehensive coverage until the loan is paid off. If your vehicle is more than 5 years old and/or less than 10 times the amount you pay to insure the vehicle, you probably don't need to carry the extra coverage. Discounts. Make sure you are taking advantage of all the discounts that are available to you such as: being a safe driver and insuring your car and home with the same company. Maintain Your Credit. Most insurers will most likely want to check your credit when you apply for a new policy. Maintaining good credit will help you get the best rates. Shop Around. Shopping for auto insurance may seem about as interesting as going to the dentist. Thanks to the internet, this process is a lot easier and you don't have to contact multiple companies. There are sites such as InsureMe that allow you to put in your information one time and they will submit it to multiple insurance companies for you. I recently used them and it took me less than 10 minutes to enter my information and I received several instant quotes. Allstate Insurance - Free Quotes and $100 off your deductible the day you sign up. 21st Century Insurance - New drivers report saving as much as $300 on auto insurance. Esurance - "Quote, Buy, Print"
Good tips, also be sure to revisit your coverage at least once every 6 months to a year because rates change constantly (as well as your current insurance needs). Here in Texas our car insurance rates can fluctuate a low depending upon where we live so it pays to shop around right after a move too.